Bossing nature about is the key to all the wonderful vegetables and fruit that we find in the garden, on trees and bushes and finally in the markets and supermarkets. But sometimes plants don’t like to be pushed around and want to feel weak and feeble and ill and to give up the ghost. You can be nice to them, learn their first name, weed all around them, give them some medication – but when they want to feel sick, they want to feel sick and they often do it fast when your back is turned. from one day to the next, BLACK ROT arrived on its black horse with its evil spells and turned the vineyard into a leper colony. 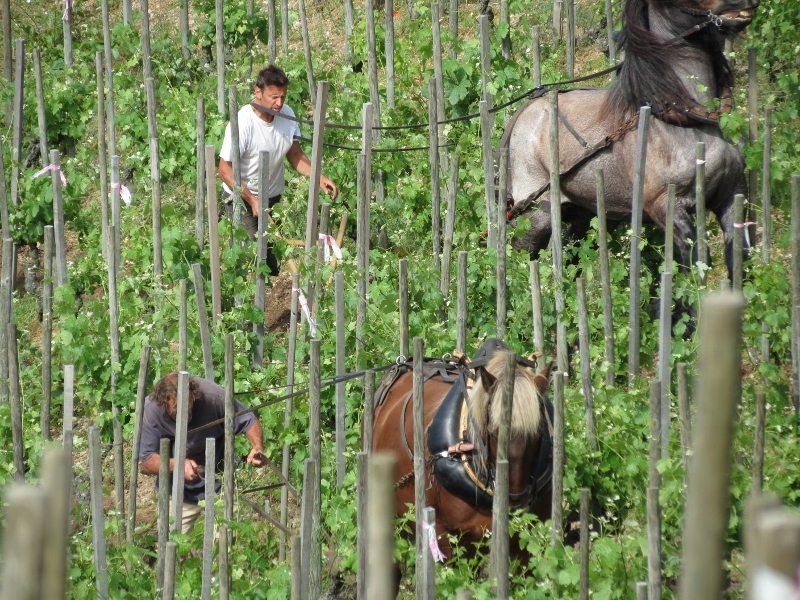 The only consolation is the fact that 2013 has been a very strange year for French wines. With the awful weather in May, the growing cycle of the vines was delayed by two to three weeks. Even when the sunny summer finally arrived the grapes never managed to catch up and in all vineyards across the country the harvests are one to three weeks late, an event which, according to Ministry of Agriculture statisticts has not happened since 1988. 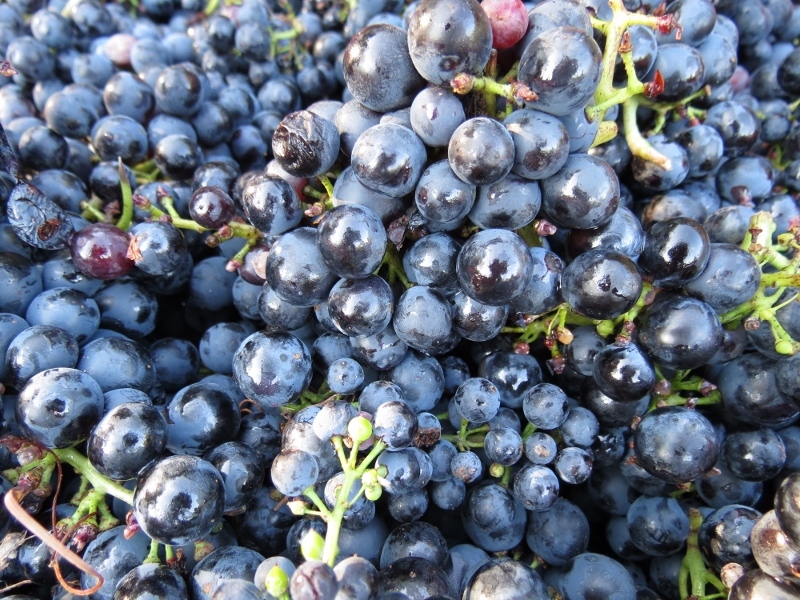 This year the grape picking and general festivities at Morlanche will be on October 12. 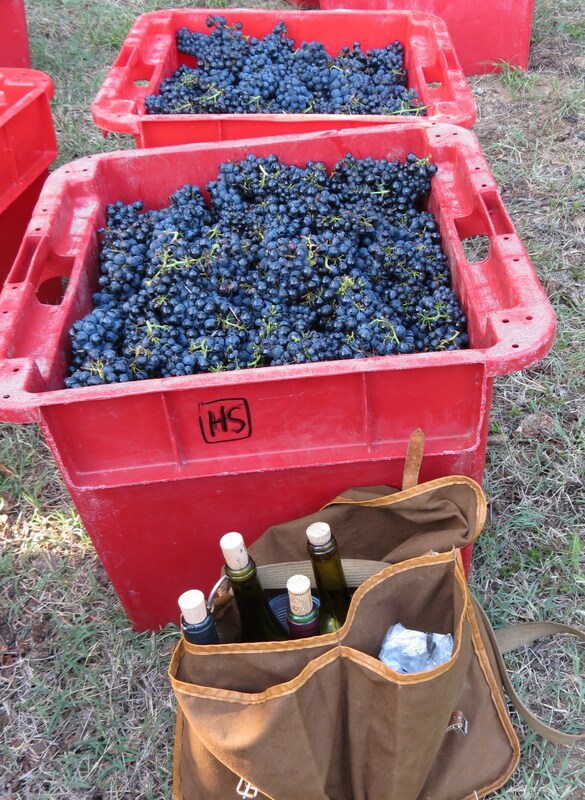 Never, since 1990 when we first started to be part of the Morlanche vendanges, have we harvested in October. What the same statistics predict is a harvest below average in terms of quantity. Better to make a mistake in a bad year than in a good one! Now for the good news. 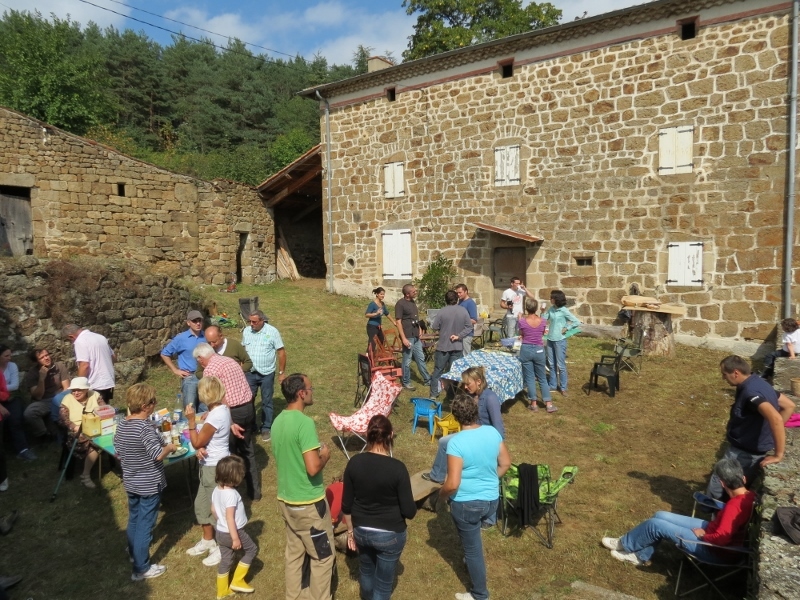 In June, the beatiful Hermitage hill, where we usually take our Walksweeks visitors for a walk followed by a winetasting, was listed as a French Heritage site. Here is a good place to observe how humans have succeeded for generations in bullying nature with the help of a horse or two, manpower and a bit of bouillie bordelaise and sulphur. 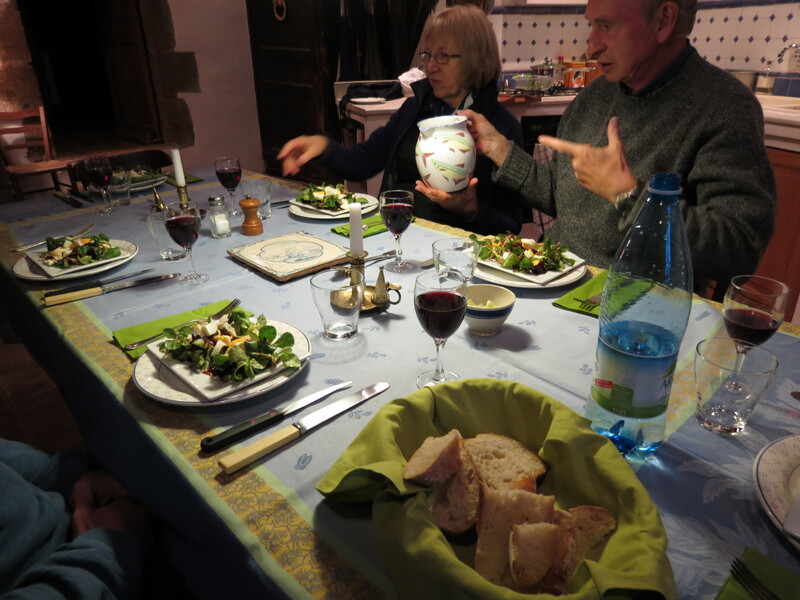 We are not quite there yet at Morlanche – need to find a horse first! 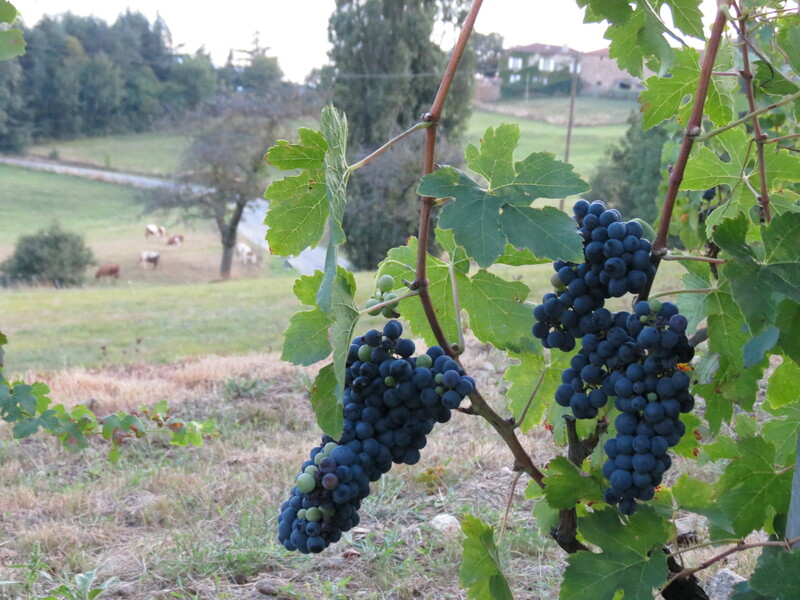 This year was a turning point in the history of the Morlanche vineyard. Markus, together with Amaury and Brice, the two family members who are carrying forward the project, have been aiming to reduce their use of chemicals and to cultivate the grapes in a more traditional fashion. Then the thought occurred to them that it was rather discouraging to see the harvest go off to the co operative in the Rhone Valley to be lumped in with a mixed bag of grapes from various producers resulting in a respectable, but anonymous wine. Until the 1950’s Arlebosc was known for its wine. Altitude permitting, most of the farms in the Ardèche had small vineyards to satisfy their own consumption, but Arlebosc and neighbouring Empurany produced enough wine to export it to the villages of the Haut Vivarais and even other Départements. 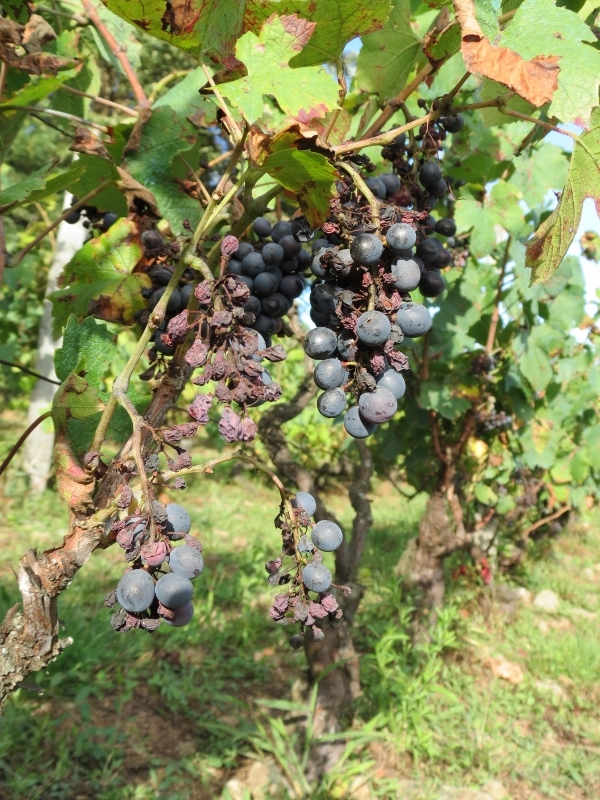 On the plateau de l’Ardèche, a windswept area towards the Massif Central one drank “le vin d’Arlebosc”, and many preferred this Gamay to the famous Syrah of the Rhone valley. In the 60s and 70s new agricultural policies and subsidies together with the decline of local cafés encouraged farmers to replace the vineyards with more lucrative apricot, peach and cherry orchards. 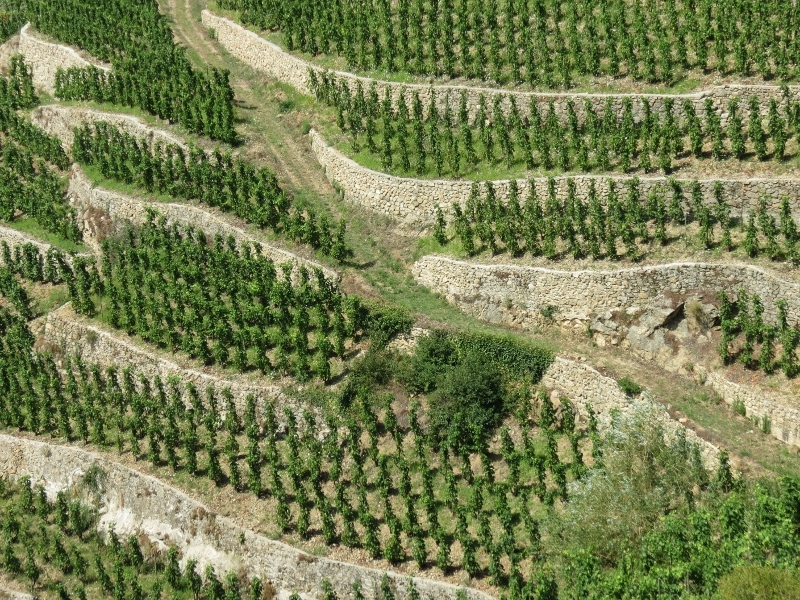 The Arlebosc vineyards started to disappear progressively. This could have been the end of the story, if it hadn’t been for Hervé, who in the 90s started a new adventure in Arlebosc. 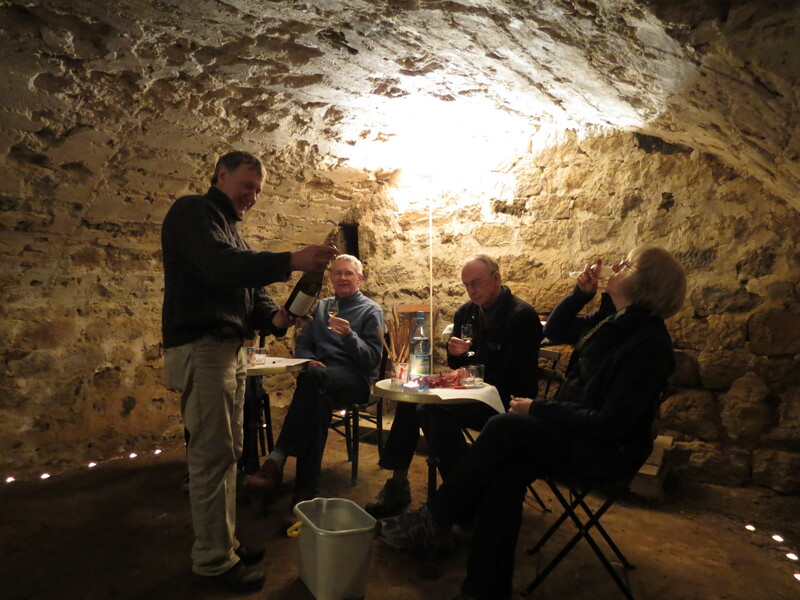 Taking advantage of the wonderful medieval cellars at his parents-in-law’s manor house Les Romaneaux, he began to produce his own wine – and not just any wine, as you can see from his website http://romaneaux.destezet.free.fr/presentation-e.htm . So an approach was made and Hervé came to inspect the work of the Morlanche team. He made gratifying remarks about their hand weeding and the condition of the grapes and gave us lots of information and insights, (the most interesting being that the locals used to refer to their white grapes, grafted with a cutting, as Morlanche, which we discovered is one of the many names used for Chasselas grapes). 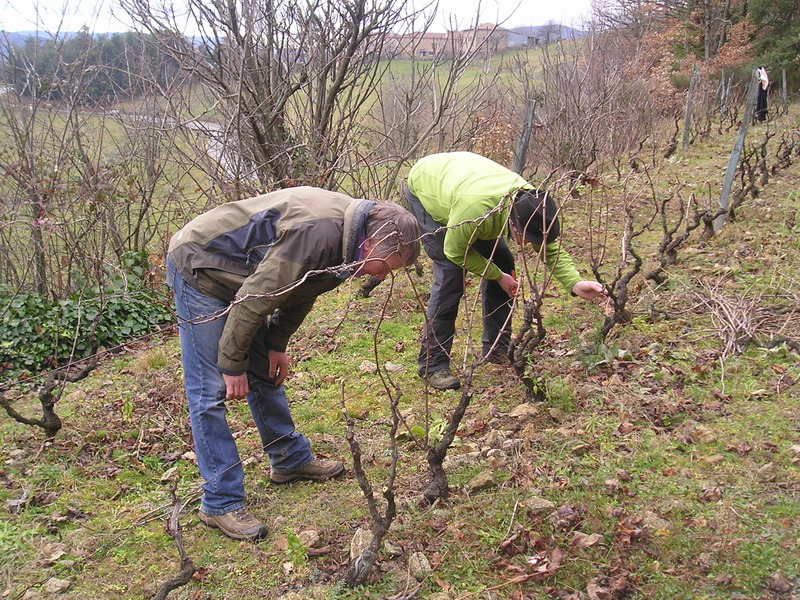 Hervé’s commitment to making natural wine avoiding the use of additives made a joint venture obvious. So for the first time the vendange went just to the other side of the village to be pressed into a truly local cuvée. Look out for La Souteronne by Hervé Souhaut and think of us. Cheers! 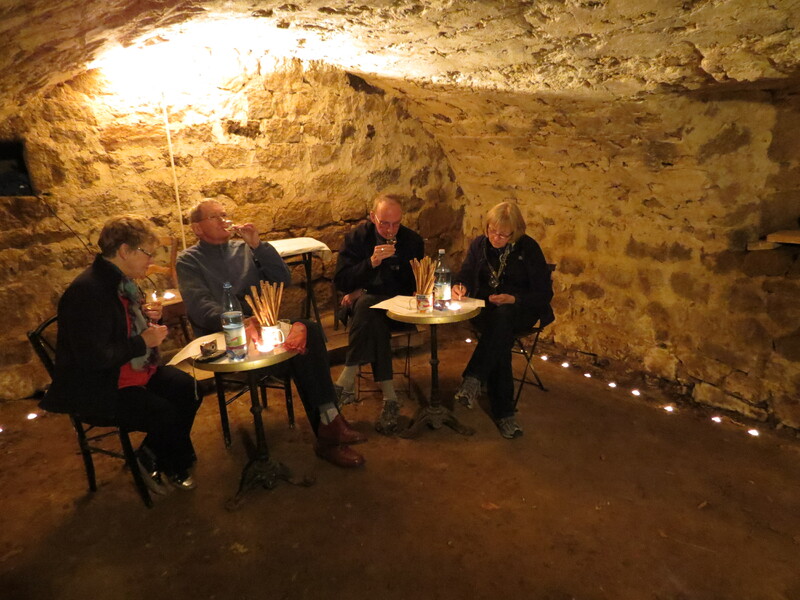 Markus has started a new initiative – a “dégustation” in our own wine cellar at les Sarziers. 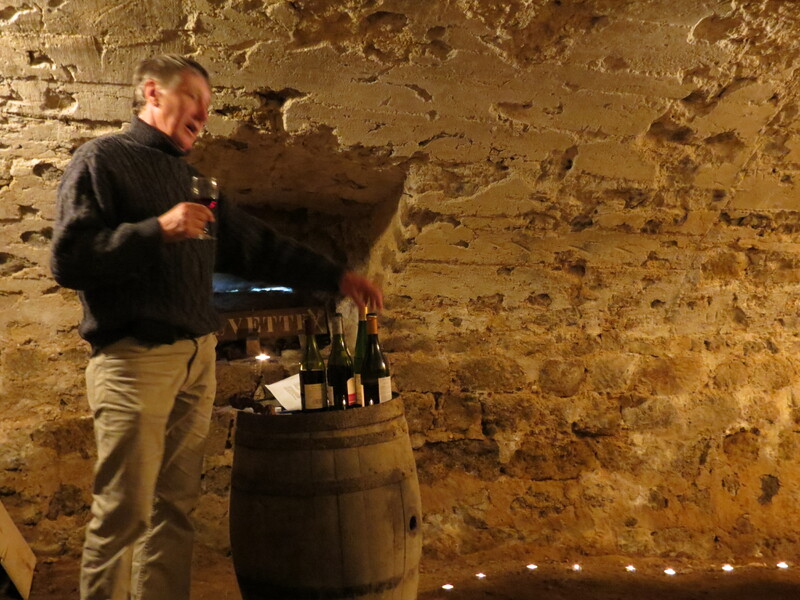 Here he takes us through the local Gamays and Syrahs right up to the noble Hermitage from Tain whilst also adding, for comparison, a Riesling from Alsace and a couple of Burgundies. The intimate and atmospheric setting is ideal for appreciating those elusive aromas and flavours and for sharing impressions in an informal way. And later on, the Hermitage was just perfect with the cheese course at dinner. 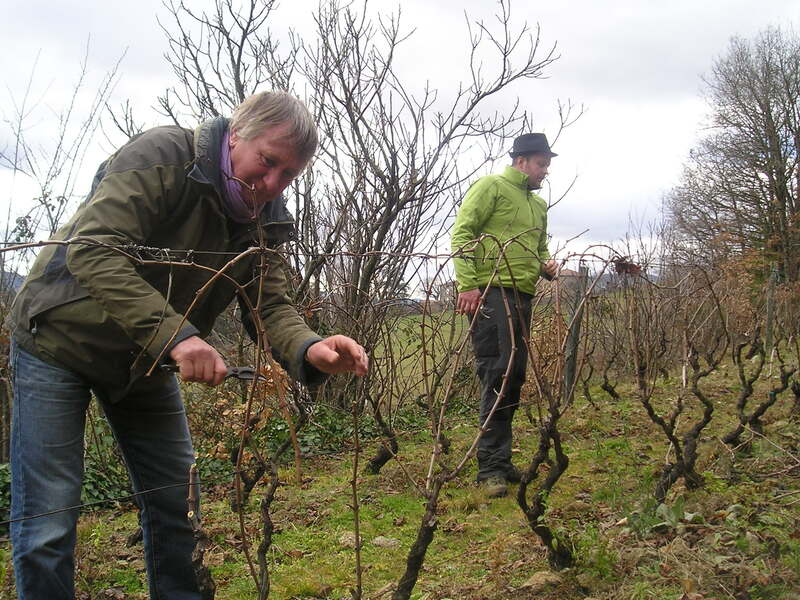 Assiduous readers of this blog will have noticed that Markus is deeply involved with the vines at Morlanche. 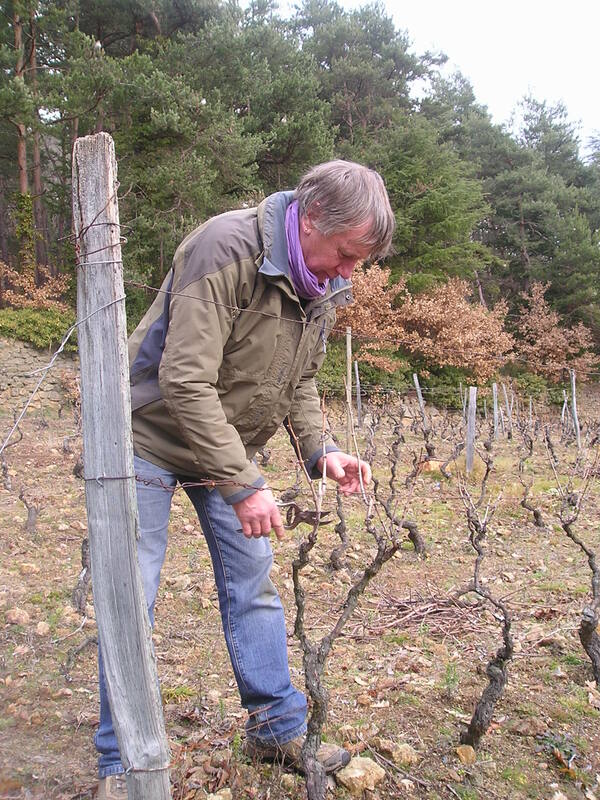 He has always dreamed of having his own vineyard and by helping the family to keep this old one alive he is able both to learn and experiment the different techniques needed to maintain and hopefully revitalise the old Gamay ceps. 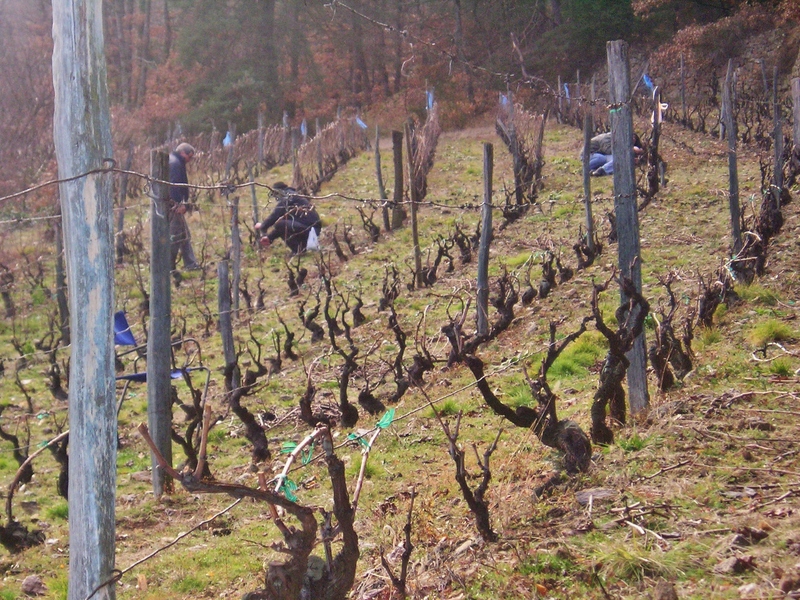 January 22nd, St Vincent’s day, is traditionally thought to be an auspicious date to start the winter pruning. Various reasons are attributed for this choice – most of them somewhat far-fetched, such as the fact that the word vin is contained in the Saint’s name, that he may have been martyred by being crushed in a wine press and that his hungry donkey chewed at the vines in winter, thus inventing the notion of pruning. More prosaically this is probably just a good time, when the plants are completely dormant. Pruning too early means struggling with foliage and springy stems, too late and the vines weep distressingly copious tears of sap. So here he is with friend Amaury studying each plant carefully to determine how to encourage vigorous and crucially, fruit-bearing, new growth. They spent a couple of days in the vines, enjoying the quiet short days of winter, the birdsong and the hazy sunshine. There was not a lot of conversation, because they say that each plant presents its own conundrums and the job requires a lot of concentration before making the fateful cuts. Presumably a lifetime’s experience makes the job a bit easier! Various other family members stopped by to help, and the newest baby girl was much admired in the kitchen whilst the lunchtime roast boar was being prepared. Now the vineyard looks trim after its new haircut and there are neat bundles of cuttings ready to be used on summer barbecues. The next job will be to till over the soil between the rows and work in a load of manure – we don’t know if there is a patron saint for that task!